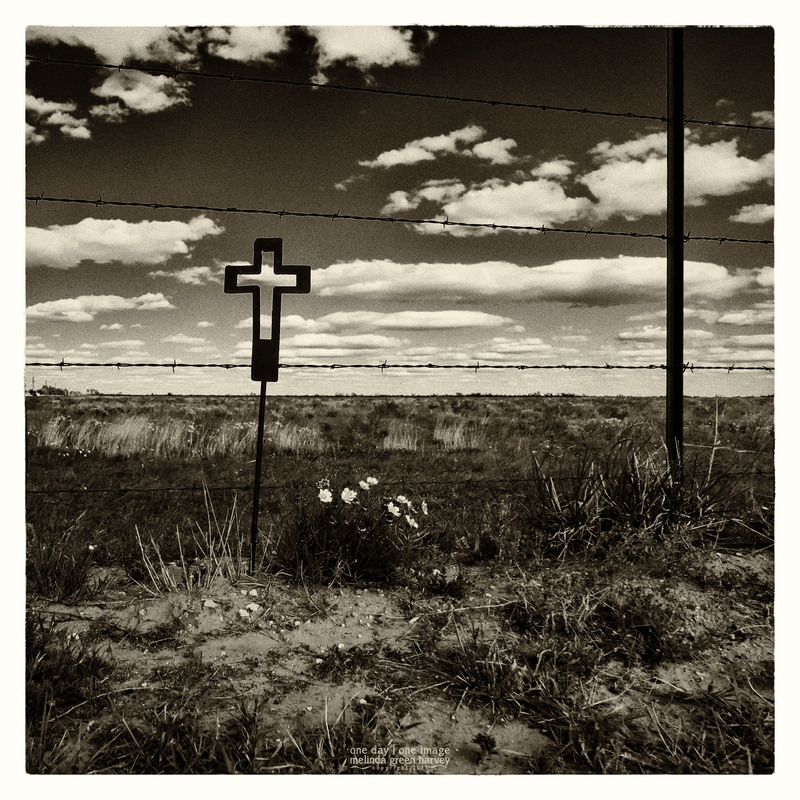 Maybe you knew that I got my photographic start by shooting roadside crosses (or other memorials). I did it for ten years, and became adept at spotting them. The last one I shot for the project was around 2006 or so, when it seemed like I done all the roadside cross work I wanted to do. Sometimes, I still do shoot them, like last year when I did a post on the series of crosses between the town where I work and the city where I live. So, while I do still notice them, I don’t notice them to the point of stopping. Until this one. I’ve gone by this spot a hundred times and never saw it. And, in fact, might not have ever seen it but the Patient Spouse spotted it and took me out to see it. And even with him saying, “It’s right there. There. TO THE LEFT.” it still took me a while to see it. Posted on May 11, 2017, in Photography and tagged 365 photo project, black and white photography, learning to see, Leica, lubbock, lubbock texas, melinda green harvey, monochrome, one day one image, photo a day, photography, postaday, Ransom Canyon, Ransom Canyon Texas, roadside cross, texas, thoughtful seeing. Bookmark the permalink. 9 Comments. Much thanks to the Patient Spouse! Wonderful image and tonality. Great idea for a series. Thank you very much; I appreciate your taking the time to comment. I just followed your link .. oh my your photos are beautiful. We have crosses not far from where we live .. I have always felt strange about photographing them. When I started the project, I made some rules for myself about photographing the memorials. I never, ever, touched anything. I never made jokes about it (even to myself). I tried to be respectful of the person who died there and their families. I was quiet (even when someone was with me, I tried not to talk). As I shot the images, those rules became as much a part of the project as the memorials themselves.